Many log home living areas are centered around a fireplace, wood stove or gas hearth. Many new options are available to provide the warmth and intimacy of a fire, with clean new looks and interesting configurations. 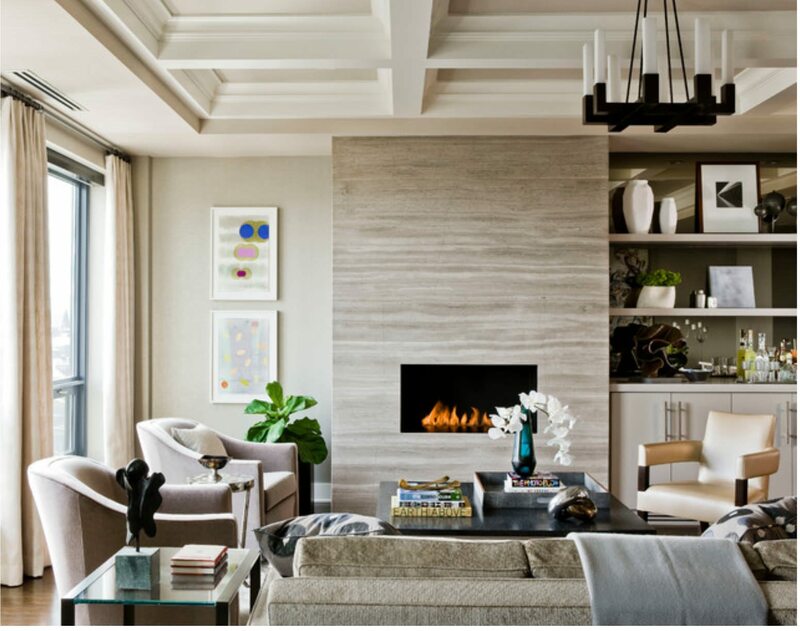 First, it’s essential to understand some recent updates in codes regarding fireplaces. Recent revisions to the ICC 2012 efficiency codes address ensuring that conditioned air leakage is restricted as much as possible in homes. Of course the regulations tackle gasketing around windows and doors and sealing the exterior envelope from air infiltration. These regulations also take a new look at fireplace leakage. 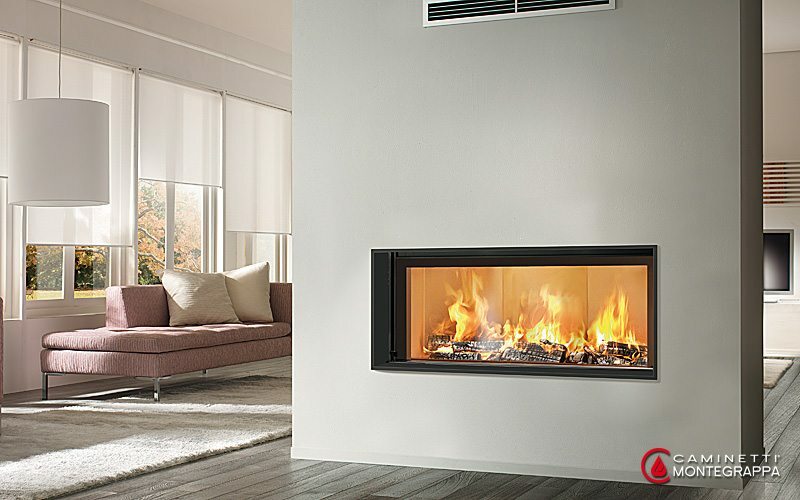 The open hearth fireplace and flue is one of the biggest sources of air leakage in a home. To that end, the regulations indicate that sealed glass doors are required on open hearth fireplaces and outdoor air combustion must be present. While some states are enforcing the new regulations more vigorously than others, it’s important to be aware from the planning stages that in new construction, open hearth fireplaces no longer meet regulations unless gasketed glass doors are installed. With the emphasis on expanding the living area to the outside around log homes, one new innovation is sure to provide versatility: the indoor-outdoor natural gas hearth. Heat&Glo’s Twilight series gas fireplaces (above right) provide flame-side views from both inside the home and outside. The unique construction uses tempered ceramic glass on the exterior side and weather proof sealing that qualifies it as an exterior window. 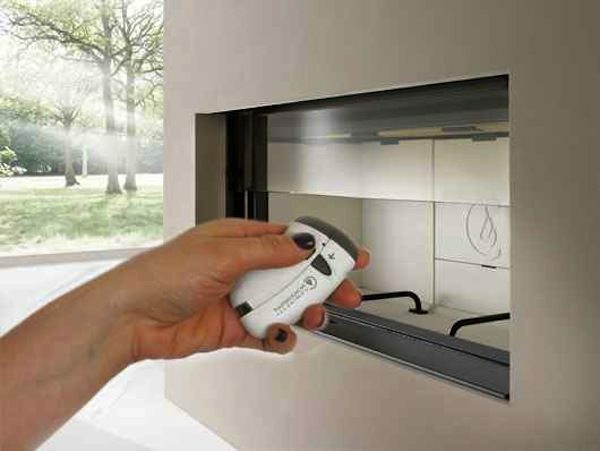 The fireplaces have remote controls and unique venting systems that require no chimney or special venting installations. The fireplaces offer a moderate amount of heat to surrounding areas, dependent on climate, room size and other factors. While the indoor-outdoor hearths expand the depth and hearth area, other homeowners look to a more minimalist approach to fire in the home. The “Ribbon of Fire” stretches and flattens the flames into a single strip or ribbon. The effect is visually stunning, and offers an option to the high-maintenance traditional wood fireplace. 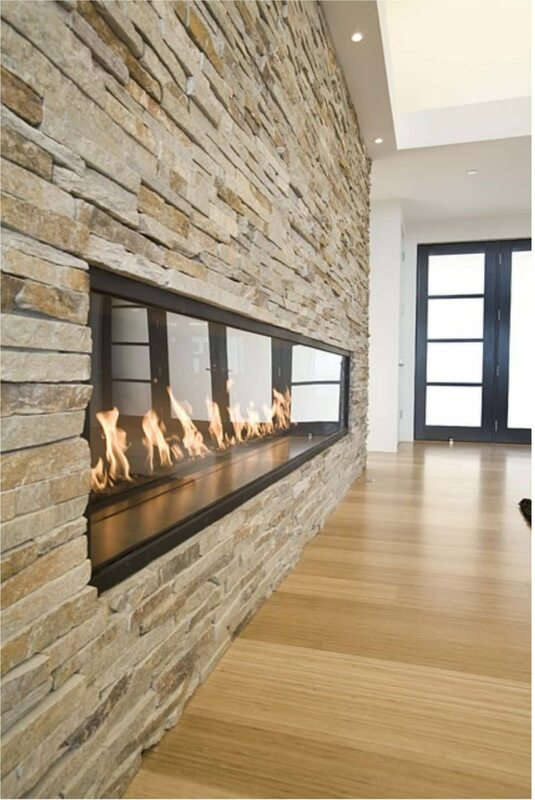 Earth Core offers ISO-Linear gas options for linear gas flame effects. The linear systems are placed within Isokern pumice, mined from the Hekla volcano is Iceland. This source provides a clean and consistent pumice medium to capture the warmth of the flames and store for radiant heat. By definition, any EPA BurnWise rated fireplace uses outside air for combustion then circulates indoor air around the firebox to maximize heat transfer is highly efficient. If a wide screen experience with flame is craved, check out the Fiamma™ Caminetti Montegrappa Light 06 (at left), which is most certainly the sports car model of wood burning fireplaces! The firebox, with large viewing window, measures 47 inches by about 19 inches tall and is rated in the EPA’s BurnWise program as having the lowest emissions available due in large part to the high-tech liner that has refractive properties that ensure optimum combustion. The combustion chamber is further enhanced by a flame distributor catalyzer and can be either a natural convection or fan-assisted. The Caminetti features a glass door that is raised and lowered by remote control (right) and the glass tilts out for easy cleaning. Even with new energy efficiency and sealing requirements log home owners can still include drama, beauty and style with these hearth choices.